History has shown that a battle cry can be a powerful weapon. Not only does it create a feeling of unity among the ones performing it, but the cry also strikes fear into the opposing side. Although many battle cries have been lost over time, there were always attempts to preserve the memory of them since they are considered an important part of folklore. However, when it comes to the famous “Rebel Yell,” regularly performed by Confederate soldiers during the Civil War, re-enacting it often proved to be harder than expected. 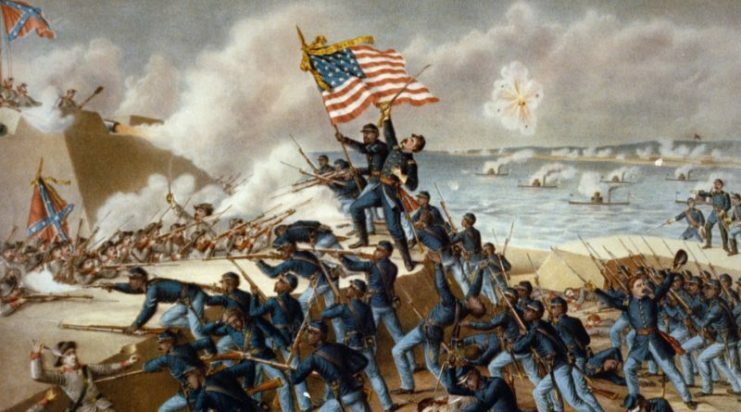 The Civil War: The Storming of Ft Wagner. Due to the lack of recording technology at the time, the battle cry remained as an oral tradition passed on from one generation to the next. This method of transmission caused some confusion along the way. Was the cry influenced by Native American war cries, or did it come from Scotland, where similar taunting was also a huge part of the warrior tradition? 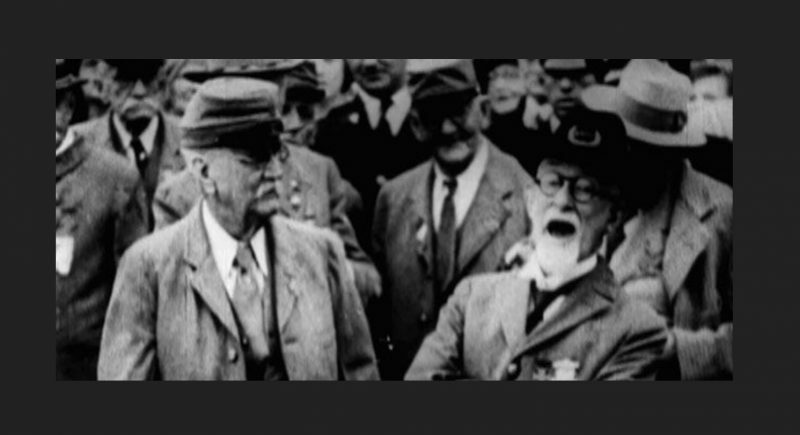 Veterans of the Civil War had been regular attendees at various patriot meetings, reunions, and parades since the early 1900s. However, it wasn’t until the 1930s when the Library of Congress organized a public event that the veterans were finally invited to perform the Rebel Yell. The men started off as a group, invoking the feel of a cavalry charge. They followed that performance with individual demonstrations. As part of being filmed, they were provided with a microphone which gave their battle cry even more power. The audience listened with great interest then cheered. In performing the Rebel Yell, the aging soldiers were proudly reminded of their glory days. The recording is of great historical importance. It removes all doubt about what the famous cry was like, and the sound will be preserved for years to come. This particular gathering caused a surge of interest in the battle cry. 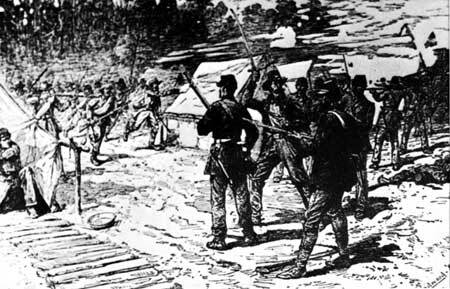 Other witnesses and participants of the Civil War were called upon to deliver their version of the Rebel Yell. Some used storytelling to re-enact the dread it once caused. 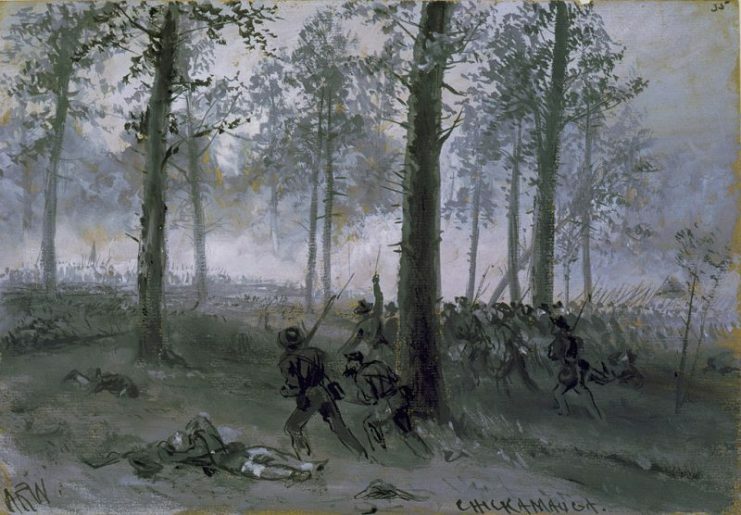 Battle of Chickamauga, Confederate line advancing uphill through a forest toward Union lines by Alfred Waud. It is hard to describe in words what the Rebel Yell sounds like. Some say it is a “yee-ha” or a “yee-aay-eee.” Others claim it’s neither of the two, but rather a high-pitched “wa-woo-woohoo.” The Union soldiers compared it to a rabbit’s scream while the Confederates thought it mimicked the sound of a cougar. Watch the video and judge for yourselves ― we guarantee it will give you the chills!